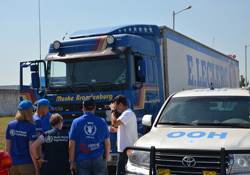 WHO and health partners deliver medical kits to support people living in conflict-affected areas of eastern Ukraine. Since the beginning of the conflict, WHO has been working with health partners to ensure access to health services. Together, they provide primary health-care services, medicines, ambulances and other essential medical items. WHO also undertakes health prevention, preparedness and recovery activities such as vaccinations, training and surveillance. Hundreds of thousands of people have poor or no access to medical services due to shortages of qualified medical staff and disruptions to facilities and supplies. Together with its partners, WHO has been delivering essential health services through mobile emergency primary health-care units (MEPUs) and emergency primary health-care posts for infectious diseases (particularly tuberculosis, HIV and poliomyelitis) and noncommunicable diseases. For many people living in conflict-affected areas of eastern Ukraine, particularly in non-government controlled areas (NGCA), these mobile medical teams are often the only source of health care. MEPUs consist of a doctor, 2 nurses and a driver. They operate through the collaboration of several nongovernmental organization partners, with support from WHO and with donor funding, including from governments and intergovernmental organizations. In 2015–2016, more than 2 million patients were treated with WHO-delivered supplies, and mobile medical teams conducted consultations for over 250 000 patients. Despite all efforts, access to health services remains most difficult in areas closest to the contact line. The number of health partners present in the field is very low due to accreditation issues in NGCA, security restrictions on both sides of the contact line and continuing funding shortfalls. Limited and unpredictable access to NGCA poses a major challenge for delivering humanitarian assistance to those in need.